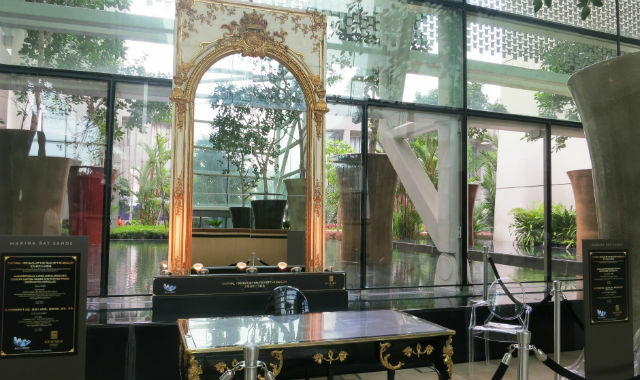 Kraemer Gallery is celebrating ‘The Final 100 Days of the Year of the Dragon’ with a showcase of rare 18th century French furniture reflecting Asian influences at theMarina Bay Sands Hotel. These “chinoiseries” are richly decorated with dragons, and Chinese visitors will further appreciate most of the pieces are displayed “on the water” through the hotel lobby, a wink to this being the year of the water dragon. “France was fascinated by China. Louis XVwas a contemporary of the Qianlong Emperor, and they had a very good bilateral trade relationship,” explains Mikael Kraemer of the Parisian gallery, adding pieces such as those on display are extremely rare as very few were made with dragons. The oldest piece in the exhibition is a pair of Louis XIV pots in blue Chinese porcelain that dates back to the first decade of the 18th Century. Adorning each of these are two dragons, slightly splayed in an S-shape, and they are resting on a broad circular-moulded base with rocaille flowers, leaves and shell-like motifs surrounding the deep blue porcelain vessel. Among the rarer pieces on display – and one of the largest in size – is an exceptional Louis XV pedestal clock (circa 1754) decorated with dragons and made by two of the leading artisans of the time: Jean-Pierre Latz, King Louis XV’s exclusive cabinetmaker; and Michel Stollenwerck, a master clockmaker. The clock includes elaborate decorations in marquetry with two winged dragon-chimeras at its base flanking flowering branches, while the clock is topped with a figure of the god Apollo kneeling in front of a vanquished dragon. The showcase also includes an exquisite Louis XV dark, golden and polychromatic lacquer commode (circa 1745). This piece features elaborate decorations in gilded bronze mounts as well as a pierced asymmetrical cartouche-shaped apron that provides the finishing touch. Using imported Chinese lacquered screen panels, the commode bears the mark of its master craftsman, Bernard II Van Risen Burgh. Founded in Paris in 1875, the Kraemer Gallery is the city’s oldest specialising in French 18th century furniture and decorative arts, and boasts one of the s largest privately-owned collections of such pieces.